A cabin on Magdalensberg. 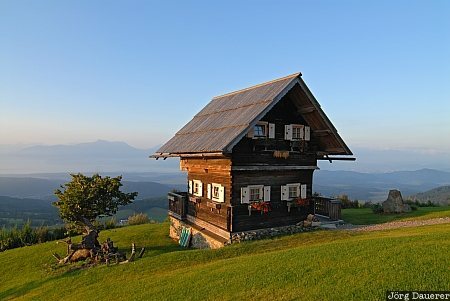 I was on top of Magdalensberg just after sunrise when this nice cabin in the middle of a green meadow was illuminated by warm morning light from the left side. Magdalensberg is near Klagenfurt in Carinthia (Kärnten), Austria. This photo was taken in the morning of a sunny day in August of 2008. This photo was the image of the month in November of 2010. This photo is in the Photo Calendar "Alps". This photo was taken with a digital camera.